Ready to Grow Your Turf Career? Minimize your time away from work and home by attending two 10-week semesters, sandwiched around a paid golf course internship / job of up to 9 months. 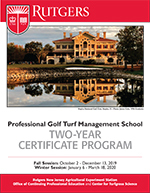 Click here for a How-To Guide on earning a 2-Year Turf Certifcate from Rutgers. Developed to help you more effectively manage the challenges faced on your golf course, our curriculum covers the essentials of turf and soil science, plant materials, irrigation technology, golf course construction and leadership skills of successful superintendents. To make our program more affordable, Rutgers offers one of the richest pools of scholarship opportunities in the country. We can also help you secure government-backed student loans. Through multiple field visits, hands-on activities and plenty of practice, our Professional Golf Turf Management School provides a ruthlessly practical educational experience. Receive personalized attention from many of the turf industry's most respected instructors. Learn from superintendents, plant diagnostic specialists, irrigation and turf consultants, as well as world-renowned Rutgers faculty from the Center for Turfgrass Science. Connect worldwide with thousands of turf industry professionals. Your instructors, classmates and Rutgers alumni will provide job referrals and technical advice throughout your career. Ready to learn more? Review the program details, learn how to apply, check out our Frequently Asked Questions, and hear what graduates have to say about the Two-Year Certificate Program.